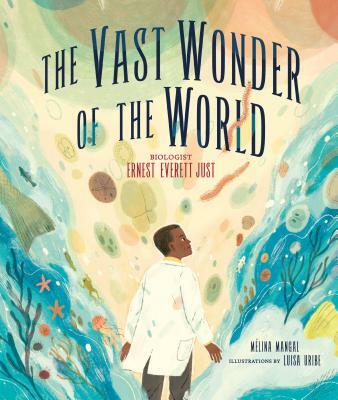 DESCRIPTION OF THE BOOK: Ernest Everett Just was not like other scientists of his time. He saw the whole, where others saw only parts. He noticed details others failed to see. He persisted in his research despite the discrimination and limitations imposed on him as an African American. His keen observations of sea creatures revealed new insights about egg cells and the origins of life. Through stunning illustrations and lyrical prose, this picture book presents the life and accomplishments of this long overlooked scientific pioneer. This book has truly been a journey for me. It was the first picture book I’ve ever worked on that told the story of a real person and, even though I’m a bit messy in real life, I’m methodical in the way I approach every project, so I had to know as much as I could before starting. Carol Hinz, editor at Lerner, recommended I start by reading Ernest E. Just’s biography (Black Apollo of science: the life of Ernest Everett Just, by Kenneth R. Manning) and it grabbed me! From there I started collecting every bit of info on all the places, people, ecosystems, etc. related to him and his work, so I could build the pictures from all this knowledge, and make them as true to history as possible. I saved every and all relevant scraps I could find on the web, and even from Bogotá it was relatively easy to dig out lots of information and photographs from the time and places mentioned in the book. Also, I was incredibly lucky in that my only sister lives in Charleston, Just’s birthplace and —as it was about to become the birth place of my niece as well— I took the opportunity to investigate some more and see in person some of the places from his early life. Sadly, the house he was born in no longer exists but a couple others nearby still do, and I found the plaque that marks where it used to stand. I had never been able to do this level of research for any project before, and it made this book very special to me. After all this, it was time to come back to the studio and start drawing. I already had a lot of ideas in my head, which sometimes makes sketching harder, as I’m set on something before putting pencil to paper, but I also had all this collected information ready to come out. After a few thumbnails and when I had a better idea of each spread, I started working on the computer, drawing first a simple and fast sketch to figure out the final composition and then a cleaner and more detailed one. Something I always try to do for all my books is keep a file where I put every spread in thumbnail size in order, so I can see how the whole book is working out in terms of composition and rhythm, and if the color is consistent with the narrative. This keeps me in check, as I tend to stray and pick weird colors from time to time. For this book the water and the ocean were my anchors in terms of color and shapes, and I build everything from there. I loved working on this book, and it makes me think that there are a lot of less well known Latinx and Colombian figures who would make perfect subjects for picture books. It would be a wonderful way to introduce them to the world!